GEHAN HARINLAL ARJUNA ATURUPANE (son of Chrystabelle and Herbert Aturupane), was born in the Mcleod Hospital in Innuvil, Jaffna on the 1st of July 1964. His siblings, are Harsha and Chonira. Harinlal was educated at S. Thomas’ College, Mount Lavinia and had a distinguished school career, appointed as a School Prefect and Captain of the School Chess Team. Harinlal won the National Chess Championships in 1984, 1985, 1986, 1988, 1989, 1990, 1991 and 1992. He was the Open Chess Champion 1981, 1985 and 1986. He represented Sri Lanka at the Chess Olympiads in Lucerne Switzerland (1982), Thessaloniki Greece (1984), Dubai in the United Arab Emirates (1986), Manila Philippines (1992). He Captained the Sri Lankan Chess Team from 1988 to 1992. He has been the President of the Chess Federation and Chairman of Selectors of the Sri Lankan Chess Team. He is a Fide Master of the International Chess Federation. Completing his education, he joined the private sector and became the Director and Chief Executive Officer of Capital Alliance Securities Ltd., Colombo. Harinlal married Namal Abeyetunga in January 1997, at Mount Lavinia. 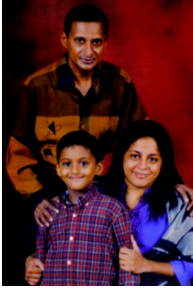 They have one son, Yeran, who is a student of S. Thomas’ College, Mount Lavinia.